CNG: eAuction 165. SELEUKID KINGS of SYRIA. Antiochos IV Epiphanes. 175-164 BC. 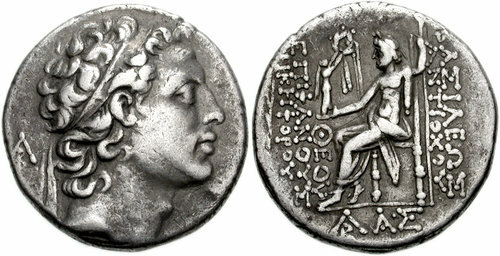 AR Tetradrachm (28mm, 16.78 g). Ake Ptolemais mint. 165, Lot: 58. Estimate $200. Sold for $270. This amount does not include the buyer’s fee. SELEUKID KINGS of SYRIA. Antiochos IV Epiphanes. 175-164 BC. AR Tetradrachm (28mm, 16.78 g). Ake Ptolemais mint. Diademed head right; monogram behind / Zeus seated left, holding Nike and sceptre; palm branch in outer left field, monogram and AS in exergue. SNG Spaer -; CSE -; Mørkholm, Studies in the Coinage of Antiochus IV of Syria, 4 (A12/P47). Near VF, a little porous.